This knife belongs to my lovely wife, Brenda. (Never in my wildest dreams did I think she'd ever carry a knife...I guess that goes to show you never can tell.) It was made as a Christmas present for her in 2001. The blade is 6.5 inches of twist Damascus steel. Sterling silver guard. Fluted Ivory handle. 18 karat gold ferrules carved in pierced running scrolls and set with chrome green Tourmalines. Seven mm pearl set in pommel. 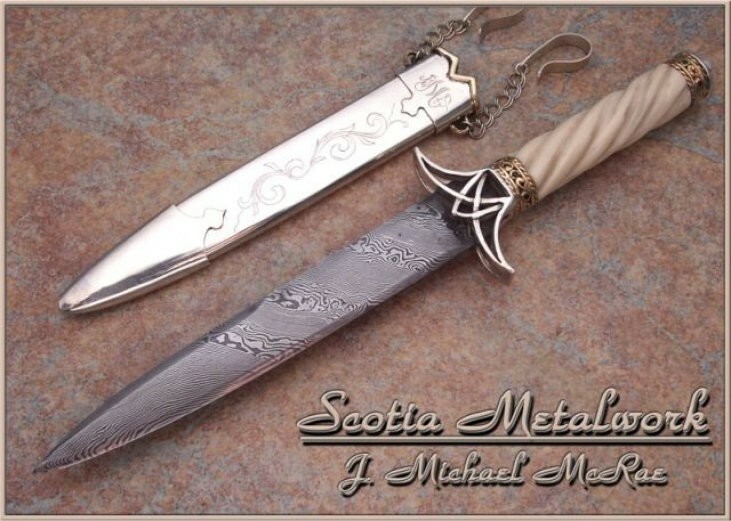 Scabbard is Sterling silver and 18k gold.